With the growing trend for flexible working and an increase in freelancing and entrepreneurship – as well as the rise in awareness of sustainable building practices – there’s huge demand for home offices. 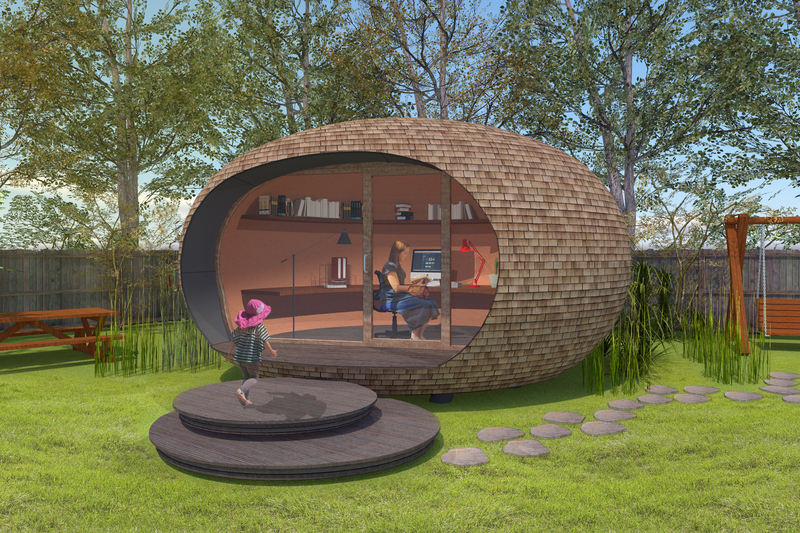 With space at a premium, an eco office pod that fits in your garden is the perfect solution. Moreover it’s environmentally friendly, quick to assemble and is actually designed with your productivity in mind. The eco office pod design keeps the same form as the larger PassivPods but is much smaller and designed to fit into a garden under permitted development – which means that in most cases they won’t require planning permission. The front glazing will provide garden views and ample daylighting, the pod will be made from all natural materials, highly insulated and well ventilated. This will ensure superior internal air quality and energy efficiency. The innovative pod shape has been designed using biophilic principles, which is an architectural style which incorporates and mimics nature. Biophilic design has been proven to have positive psychological and physiological effects, including lower stress and enhanced productivity. The front glazing provides garden views and ample daylighting which is vital for reducing mental fatigue as per the attention restoration theory. The pod will be made from all natural materials, highly insulated and well ventilated. This will ensure superior internal air quality (good ventilation has been proven to enhance cognition in office workers) and energy efficiency, keeping your bills down as well as saving the planet. Speaking of saving the planet, the PassivPod eco office pod is zero carbon in operation with very low embodied carbon – combining comfort with sustainability, without the eco price premium. At 15m2 the space will comfortably house one or two desks plus storage. The PassivPod eco office pod is the perfect place to get your creative juices flowing, or to boost your concentration for mentally taxing tasks. It even decreases stress through its natural materials and unique, nature-mimicking shape. Maybe you want a peaceful reading nook or place to practice yoga or meditation? The PassivPod eco office pod is an additional multi-functional room in your garden which costs less than extending, is quick to assemble, and is good for the environment.